I’ve started taking lukewarm showers in the morning, instead of my usual steamy 20 minutes of utter surrender and relaxation. You don’t need a lot of time, if you’re quick about it, to lather up and condition your hair. A friend of mine says he never has a hot shower because it dries out his skin. And when you run the water so hot, you always step out into the air freezing. But there’s an ulterior motive I have, beyond avoiding flaky skin and frizzy hair: I don’t want to get sick. I’m determined to stay healthy this fall as we head into winter, the days get shorter, and cold and flu season hits primetime. Trying to skate through winter without catching a bug can be tough. Here are some words of caution – and survival tips – to see you through. I’ve read that cold showers are good for circulation and building up your immune system. Add this one to your own stay-well strategy. I’m betting if I take my fish oil, eat right and stick with cooler showers, I could stay away from the Kleenex box more often. Research from the Thrombosis Research Institute in London found that taking daily cold showers increases the number of disease-fighting white blood cells. Your body naturally tries to warm itself during and after a cold shower, your metabolic rate speeds up and activates the immune system, which leads to the release of more white blood cells. A heads-up for people with high blood pressure or other cardiovascular problems – low temperatures constrict blood vessels. Blood pressure rises as a result, because more pressure is required to force blood though narrowed blood vessels, increasing your risk of heart attack. If you put your hand in ice water, it has the same effect. Blood pressure goes up a little. The opposite can happen in the summer or hotter climates. You’re lounging by the pool in your bathing suit, the vessels in the skin are dilating, and you lose water and sweat off salt. Then your blood pressure drops. 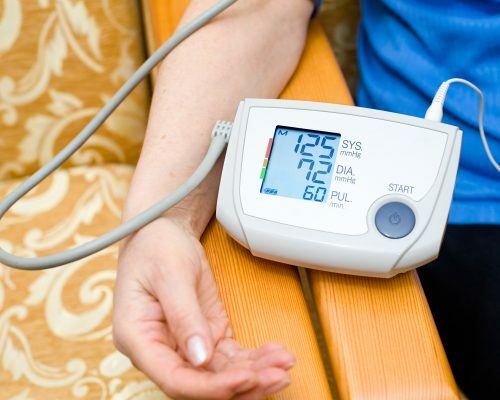 For the one in three American adults with high blood pressure, according to the American Heart Association, this is information you should get familiar with. Scientists have been kicking around the idea for years: Blood pressure is a bit higher and harder to control in colder weather. A study conducted by the VA Medical Center in Washington, D.C. and published in 2012 in Circulation, a journal of the American Heart Association, is considered one of the most comprehensive on the subject to date. The researchers reviewed the health records of 443,632 veterans nationwide during a five-year period. They found that blood pressures were consistently higher during the winter in 60 percent of the veterans. But the data also showed the pattern was the same in southern climates with much milder winters. So it’s not the cold alone, much as we like to complain about it. Evidence presented in 2012 at the American Heart Association’s Scientific Sessions in Los Angeles found that whether you have to deal with snowdrifts or be extra-diligent about using sunscreen, you are more likely to die from heart-related issues in the winter. Researchers reviewed death certificates from 2005 to 2008 from seven different areas of the United States that have warm, moderate and cold climates during the winter. They found that heart-related deaths jumped an average of 26 to 36 percent across the board. If you do live where the snow falls softly, or comes in fierce dumps, closing down roads and businesses, take care. Snow shoveling can set you up faster for a heart attack than eating a Philly cheese steak for lunch five days a week (all that heart-sabotaging saturated fat). The risk of shoveling is the sudden, intense exertion that your body is just not accustomed to. Regardless of climate, winter is hard on your heart. People tend to be more sedentary in the winter. I know my dad doesn’t walk as often, spending more time in his easy chair reading Maclean’s or watching CNN. If you’re not as active and hibernating inside more, the weight creeps on. That weight gain also contributes to high blood pressure. The point is you need to make more of an effort to take a walk or get on that treadmill. Another hurdle is fewer daylight hours, and trying to stay clear of Seasonal Affective Disorder (SAD) that can leave you listless and moody, and dampen your immune system. You lose interest in taking care of yourself and making sure you’re on track with your medications and supplements. You sleep more than you need to, and you may feel less inclined to spend time with friends and family. Your mood and outlook can easily derail your heart-healthy habits. Get outside for some of that feel-good sunshine vitamin D to boost your outlook, and call your friends more often. Seasonal influenza doesn’t discriminate between climates! The flu can cause serious heart-related problems in some people. Cold medicines, too, also can raise blood pressure, along with some non-steroidal anti-inflammatory painkillers (NSAIDS). Other experts say that stress and food choices with high fat or sodium (Thanksgiving and holiday stress and indulgences are dead ahead!) may be potential culprits for higher blood pressure at this time of year. There are a truckload of issues that can sabotage our health, and set us up for cardiovascular disease, if we’re not careful. Yes, I’m encouraging my dad to walk every day, my husband to stop turning the bathroom into a sauna, and my son to not lose his hat and mitts. Tiny victories! Good health is worth the struggle.